The Risk Investment Team (RIT) consists of 50 students of the University of Groningen. All students have a profound interest in the practice of investing. The RIT is composed of two investment teams, of which one junior team and a, slightly more advanced, senior team. The teams meet each three weeks to discuss the performance of their investment portfolios, review macroeconomic trends and introduce new investment proposals. After each meeting we have a beer at the bar with our fellow investors. In this week’s article of the Risk Magazine we provide a brief review of our realized returns and disclose some of our current portfolio holdings. Volkswagen is known as one of the most successful automakers in the history of the car industry. Nowadays, Volkswagen is a leading automaker in the markets of all continents. It is superior in the segment of reliable and affordable cars. The stable operational performance and the strong brand name made the company a liked investment among investors. However, in September 2015 this optimism around Volkswagen suddenly changed. At the time, the Environmental Protection Agency (EPA) detected a “defeat device” – or software – in diesel engines that improved the results of emission tests. Once on the road, the diesel engines switched out of this test mode and emitted nitrogen oxide pollutants up to 40 times above what is allowed in the US. The uncovering of the software is known as the diesel gate scandal. The scandal forced Volkswagen to recall millions of cars, which created its first quarterly loss for 15 years ($2.5bn). Possible legal actions undertaken by the EPA could magnify future losses. The EPA may claim a maximum fine of $18bn, a scenario that was not anticipated by Volkswagen. Besides, the financial risks associated with the diesel gate scandal could not be estimated by the share-holders. As a consequence of this uncertainty the stock price of Volkswagen AG plummeted. The large drop in the stock price is indicated by the red arrow in the figure below. As a direct result of the scandal, Volkswagen has put forward Matthias Mueller, the former boss of Porsche, as the new chief executive. His duty is to minimize the financial impact of the scandal and prevent further damage to Volkswagen’s customer base. "My most urgent task is to win back trust for the Volkswagen Group - by leaving no stone unturned," Matthias Mueller said on taking up his new post. 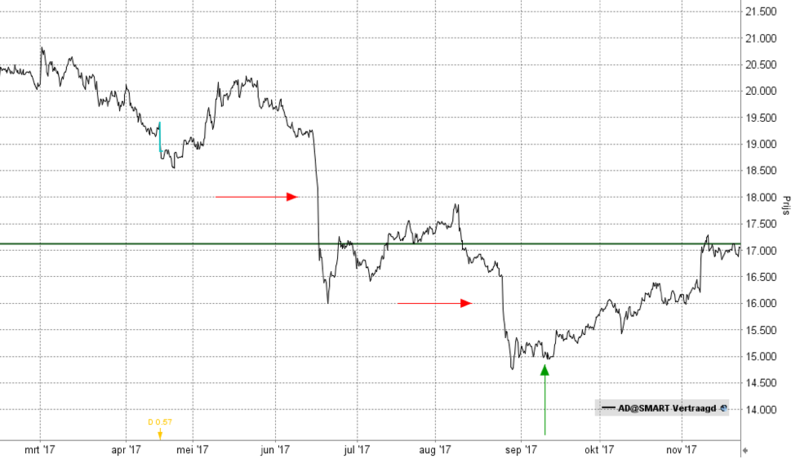 At February 27th (2017), more than a year after the crash in the stock price, we purchased Volkswagen AG at a price of €140,30. At the time we noticed a recovery of the stock price, signaling a gradual move towards the pre scandal price level. In our view, Volkswagen indeed managed to rebuild trust of customers, thereby retaining customer loyalty. In addition, we concluded that most of the fines are incurred and future claims become less likely to materialize. With the purchase of Volkswagen AG we anticipated a continuing recovery of the stock price driven by sound operating profits and decreasing financial setbacks. We anticipated a continuing recovery of the stock price driven by sound operating profits and decreasing financial setbacks. At November 20th (2017), nine months after we took position in Volkswagen AG, our limit order of €168 per share has been reached. The automatic selling order reflected the price target that is agreed on in the initial investment proposal. The result is a decent return of 19.74% on our investment. Although we sold our position, we are still optimistic about the future for Volkswagen. We do believe in a further gradual increase of the stock price, but rather decide to secure profit and focus on new investment opportunities with a higher upside potential. Ahold Delhaize is a world-leading food retailer with 6,500 stores worldwide, serving 50 million customers a week. It generates roughly two thirds of sales in the United States. The other fraction of sales is mostly generated in the Netherlands, which is where the company is established and listed. Ahold Delhaize is considered as a defensive share - less sensitive to developments in the economic cycle than cyclical stocks. This usually implies less volatile stock prices. However, recent developments in the retail industry gave birth to nervous responses of shareholders. A massive sell-off of Ahold Delhaize stocks occurred on the announcement of Amazon intervening the US market by acquiring Whole Foods, (see the previous article about the entry of Amazon in the US supermarket industry). 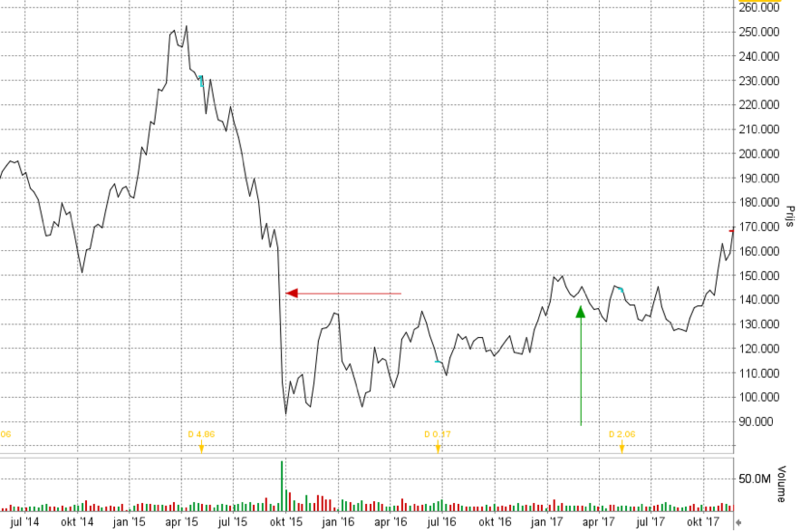 Ahold Delhaize stock dropped by 19.4% on the news, see the red arrow in the left of the figure above. Investors panicked as they fear the threat of a price war that Amazon may set in motion. In the eyes of investors, aggressive price competition lowers the retail margin and possibly drives Ahold Delhaize out of the US market. They expect Amazon to have sufficient financial resources to continue such pricing behavior for a long period. To make things worse, only a few weeks after the acquisition of Whole Foods, Amazon indeed announces to cut down the retail prices of Whole foods, see the red arrow in the middle of the figure above. Investors again reacted shocked to this decisive move of Amazon, which once again caused Ahold Delhaize to end up in a free fall. When we contrast all of this to the intrinsic value of Ahold Delhaize there is no direct cause for great concern. The latest earnings of Ahold Delhaize did not indicate any downward trend in the retail margin. Moreover, sales grew by 2.1% at constant exchange rates. Next to a good sales performance, Ahold Delhaize targeted the benefits of the synergies- from the acquisition of Delhaize- from 220 to 250 million for this year. Furthermore, it managed to win market share in the US and signaled confidence by starting up a share buyback plan of € 2bn. On that account we believe that investors overreacted to the ‘Amazon threat’. In our opinion, therefore, the earnings to price yield is far too high. In light of the reported earnings we conclude that Ahold Delhaize is strongly undervalued. The argument of the ‘Amazon threat’ is insufficient to justify a decrease of almost a quarter of Ahold Delhaize’s market value. For that reason we picked up Ahold Delhaize at September 9th (2017), when it traded at a stock price of €14,97, see the green arrow in the figure. Our strong belief in a comeback of Ahold Delhaize’s stock price made us willing to take more risk. Instead of buying the shares, the team put forward a Turbo long with a double leverage. Simply put, every incremental movement in the price of the underlying could lead to disproportionately high returns due to the leverage effect. In our case, a stock price increase of 1 percent increases the return by 2 percent. A Turbo is the ideal instrument for active, market-oriented investors to benefit from short-term market fluctuations. In our most recent meeting, dated at November 20th (2017), we decided to close our position in the Turbo Long and booked an impressive profit of 28.72% (two times the actual percentage change in the underlying stock price). A perfect return on the short term gain of Ahold Delhaize! For the medium run we still belief in a further recovery of the stock price of Ahold Delhaize. This led us to reconsider a long position in Ahold Delhaize, but this time with a more conservative investment. After the quick ride with the Turbo long, we now bought the actual shares at the price of €17,12. In this way we are less exposed to potential losses. Another reason for buying shares lies in the fact that shares do not require financing costs. In the case of a Turbo, part of the cost of the underlying asset is financed by the bank. The bank in turn requires additional costs for that financing, like an interest payment. The Transition to Driving Fully Electric has already Started, when will it be Complete?